SNES Super Metroid (JPN/USA) "X-Ray glitch" in 21:35.57 by cpadolf. This is an improvement of 25.61 seconds real-time, or 22.98 seconds in-game, over the previous glitched any% run. 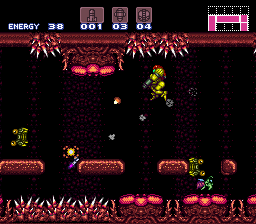 The main improvement comes from a new method of skipping the cutscene with the big metroid, although the author found many other improvements along the way. The peculiar effects of the Space/Time Beam, if properly utilized, can cut this run's time further in half. The movie will have to begin from a savestate, but Samus will start the game fully powered-up, so item collection and all detours associated with it are no longer required. Such a movie, also made by Cpadolf, can be found here; its completion time is 12:46 (00:06 by the in-game timer). Speed Booster route 14% by NameSpoofer in 44:18 (00:29 by the in-game timer).